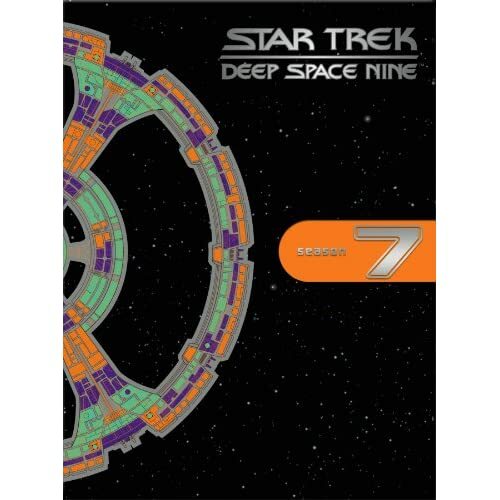 Deep Space Nine's seventh and final season came down to loose ends, tying some existing ones together while allowing others to unravel. Symptomatic of the unwillingness to let DS9 go was the immediate arrival of a replacement Dax, though poor Nichole deBoer as Ezri Dax had to have known she'd already missed the boat. Her appearance encouraged last-minute romances to blossom, with Bashir finally getting some action, Odo finally getting together with Kira, and Sisko finally proposing to Kassidy. Another contributing cute factor were numerous trips to the holosuite wherein the all-knowing Vic Fontaine dished out philosophical advice. That was when the crew wasn't in there to play baseball against the Vulcans, or when Nog wasn't commiserating about the loss of a leg. Oh yes, and don't forget the War! There was an early announcement that the show would attempt a 10-part resolution to the Dominion War, but viewers could be forgiven for forgetting all about it with so much sentimental distraction. When the horrors of war did resurface, they at least injected a few surprises into the mix. Odo and his ambiguously "evil" Founders were hit with a melting disease, prompting a backstabbing race for the power of developing and owning a cure. The original baddie Cardassians finally settled on the Federation's side. Contrary to these interesting twists, however, were the unexpected turns taken by matters relating to Sisko's spiritual destiny. Suddenly the mystery of the wormhole and an entire religious belief system was reduced to the problem of correctly translating the words of a sacred book. The struggle to join with some evil aliens significantly diluted the attempt at resolving what had begun seven years before in the show's pilot episode. Ultimately, Sisko's destiny, as with all those who'd followed him to the open-ended climax, was to be decided elsewhere. In a move that was either bold and daring--or possibly born of desperation for not having thought things through properly--the show's storylines were to be continued in a series of spin-off books. Series 7 here and Discs 1 to 3 added.